I've been terrible of late trying to keep up with blogging, Facebooking, emailing and everything else internet related. Sometimes you just get overwhelmed with it all! And just in time for the Online Needlework Show (April 17-22) are two new designs, Shades of Wine and Spanish Diamonds. Shades of Wine, the second in the Shades series is stitched in 3 colours of Dinky Dyes silk floss. 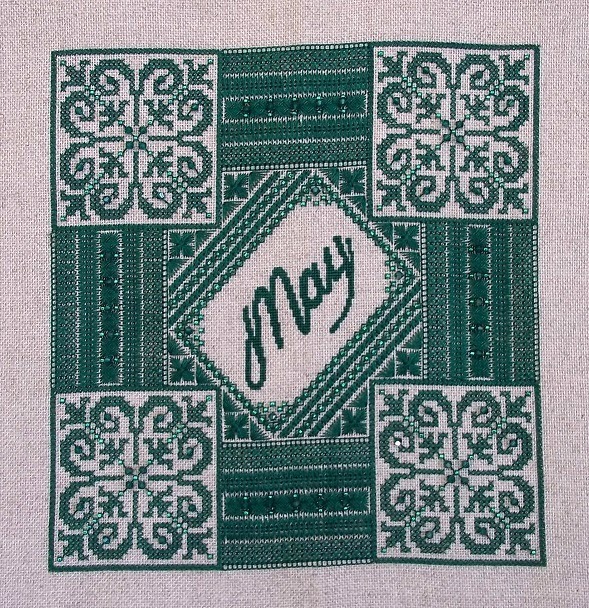 I stitched mine on 40ct Alabaster from Sassy's Fabbys, but because it's all cross stitch, you could stitch it on any count you're comfortable with. :) I'm so pleased I was able to finish this one in time, I started it back in February when I was testing out the colours, but only stitched a little and didn't pick it back up until the end of March. I think in all I finished it in 2 weeks. I don't know if I'm happier that I got it done in time or happier that I can sleep again! 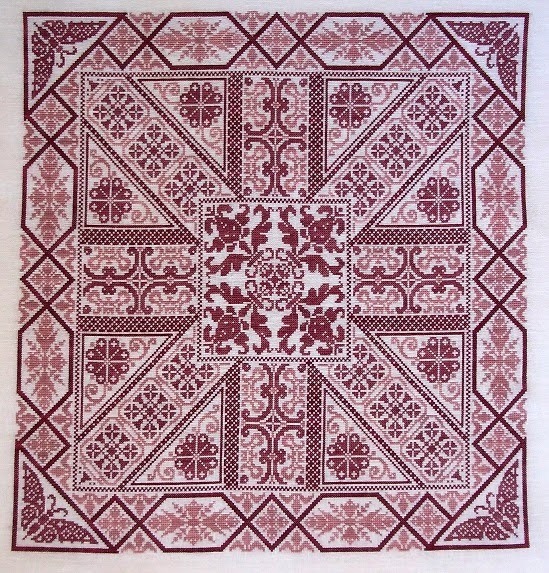 Spanish Diamonds is very little cross stitch, instead it uses eyelets, rhodes, four-sided, ray, satin and various other stitches to make up the intricate diamond patterns. 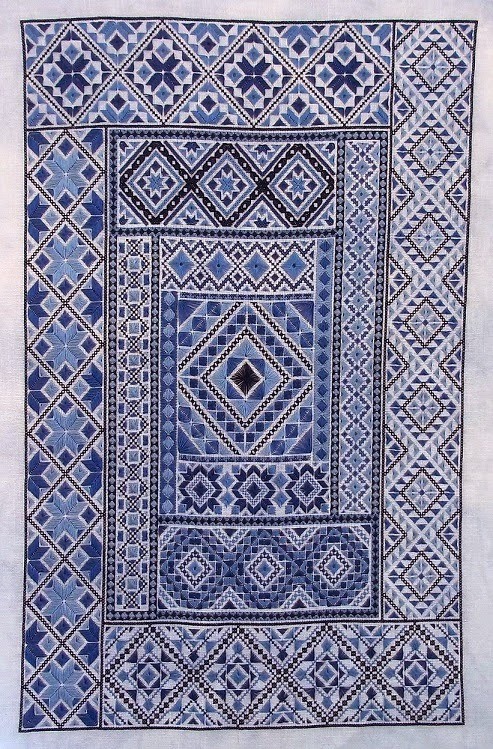 It's stitched in 5 shades of Silk Mill floss, and I used 36ct Aerial Linen from Picture This Plus. You can of course use any count, but linen or evenweave are recommended because of the stitches used. This 31 page chartpack includes diagrams for all sizes and shapes of stitches used. This one stitches up surprisingly quickly! These will both be available to shops on the Dinky Dyes page of the show. Lots of other stuff going on this month here at Northern Expressions. I'm working on the next birthstone, June's Pearl, which will be coming out later this month. Then I need to get to work on the next few bands of The Learning Sampler to stay ahead of the group - though Marjan is almost finished hers and already working on Part 17!! I also need to get stitching on a Christmas stocking for my new nephew who is due to arrive in August! I'm FINALLY going to be an auntie! I'm so happy! This will be the first time in a decade or more that I've done a Dimensions kit. Not sure if I'm excited or dreading it. Not a fan of Dimensions kits, but my brother's fiance picked it out and it IS a really nice one. And finally, I know many of you read a vent on my Facebook page a couple of weeks ago as yet another of my designs had been infringed. I have to say, I was really touched by the messages I received from everyone - it IS nice to know that all the hard work is appreciated. It's hard to describe the feeling when I come across one of my designs on these sites. Anger, obviously, and disappointment, but there is also this feeling of violation that is so hard to put into words. My immediate reaction is always why do I bother, but the answer to that is simple. I bother because I love what I do, and as long as hubby and I can keep making ends meet each month, I'll keep doing it.